Though the origins of Joxfield ProjeX are rooted in the late 1960s, The Swedish duo of Stefan Ek (aka Oax) and Janne Andersson (aka Yan) will surely understand if people have not heard of them. The two conducted their experiments with improvisational music until 1975, and then went into a 30 year "long intermission", until regrouping in 2005. And the creative impulses must have been percolating over the years because not only have Joxfield ProjeX released their first ever recordings, but since 2005 they have released four albums and two more are in the works. Describing Joxfield ProjeX is no easy task. Their music incorporates elements of psychedelia, ambient, progressive, and hard rock forms, but usually within a freeform, experimental framework. Their first album, the 2-CDR Dark White Morning, from 2005, reveals an almost explosive pent up need for expression, with a range of musical styles that sometimes seem to come from different galaxies. Tracks like "Purple King" and "Easy Flying" feature spacey melodic synths along with raw rocking guitars, the latter including a great combination of ripping exploratory psych guitar and dark proggy keyboards. There's the cosmic new wave-ish rock of "Dark White House", and the aggressive electro dominated space rock of "Hurricane". But there's also "Pling Plang", a minimalist piece with playful bouncy keyboards and rhythmic patterns alongside Fripp styled guitar and atmospherics. We're treated to experimental, spacey sound exploration on "Ambient Bells", pure floating spaced out soundscapes on "Brana Funk Sun Ra", and "Japanese Garden" conjures up images of Robert Fripp playing guitar with the Residents. Amidst all this is the somber piano and vocals song, "A New Morning". And its all topped off with my favorite two tracks of the album - the free-wheeling, and often intense mixture of rock, noisy psychedelia, and cool jazz grooves of "Brana Funk", and "Day Clubbing", which is like Ozric Tentacles remixed for a rave. Totally freaked out… but you can dance to it! Joxfield ProjeX were on a creative roll and in the same year released Nothing But Sofas, which they describe as their "pop" songs album. "Pop", of course, is a relative term when it comes to a band like Joxfield ProjeX. There are indeed songs, with composed melodies and vocals. But they are far from being pop music. I like the dreamy, drifting, pleasantly melodic quality of songs like "Prince Gong Climbes The Great Wall At Mutianyu" and "As Close As You Are". "Threadmill" is similar, but with heavenly, almost symphonic keyboards. Like some spaced out Nick Drake song. "Hell Is Other People" features chunky, pounding rock, with a dark, demonic prog rock edge. "La Thiene Plateau" is like some long lost Peter Hammill song. There's the dancey space-prog-pop of "This is Paradise" and the noisy "Industry Forever", which brought to mind a robotic dancey Chrome song. And on the flip side we also have the intense, driving progressive rock of the all instrumental "Bass Bass" and "Red Lantern", as well as the grandiose space rock of "Sirens of Titan", which reminded me of Quarkspace but with more of a symphonic edge. Next to be released was Live At The Kolpebo Festival October 2005, which was intended to be a companion CDR to Nothing But Sofas. With 5 tracks, all in the 10 minute range, Live At The Kolpebo Festival was Joxfield ProjeX's most freeform, exploratory rock album up to that point. It's all about laying down an electro groove and jamming. "Sgwinsch" consists of a combination of spacey electro dance, robotic space rock, and freeform rock guitar and synth noodling. "Stonehenge II" and "Soft Night" are similar but with harder edged rock jamming. Some pretty fiery guitar on these. "Hey Black Night" is in the same style, but the guitar is pure acid-psych-metal, crashing and banging against the dance pulse. Very intense, and at one point reminded me of King Crimson's "Red", but backed by spaced out electronic dance grooves. And "Sun E.Mangs" is dancy avant-garde space rock with a jazzy flavor. Lots of fun with sounds on this track, but its also very thematic, like the soundtrack to a film. But surely the most ambitious, and cohesive, Joxfield ProjeX release to date has to be the 3-CDR The Pond Intermezzo, from 2006. Among the highlights on the first CD is "Dr Balanova", a dark, industrial prog-psych song, with whimsically spooky vocals. "No More Treasures" is a groove laden space rock track with a great combination of guitars and synths, tripping about and all within a structured song context. "Morning Silence" is similar but with eerie cabaret like vocals, later climaxing with chainsaw guitar in a full blown psychedelic carnival jam. "New Frontiers Leaving Home" is an impressive 20 minute journey, with cosmic, ultra funky grooves, space-industrial electronics and exploratory wah'd rocking psych guitar. Simply LUSCIOUS! I love how the vocals melt right into the oceanic psychedelic music on "By the Sea", as well as the searing electro psychedelic space rock of "A Stone Fell From A Palm Tree". Most of the second CD is taken up by the multi-part Black Night Theme Suite. The piece starts off with a dark foreboding march, anguished psych-rock guitars, and a variety of alien synths. While retaining the basic theme, the guitar goes off in a number of directions, but always with some form of wild psychedelic sound, and the rhythmic patterns shift just enough to keep morphing steadily. Great guitar sounds on this one and killer jamming that goes well with the war-like march. Nearly 40 minutes of experimental acidic space rock. Of the remaining tracks on the second CD my favorite is "Adme Balanova Hallucinates", with its meditative floating synths that recall 1970s German school Kosmiche. The third CD is once again dominated by a multi-part work, in this case the sprawling "Majestic Pattern City Revisited". It opens with spacey synths, but soon jumps into a rocking instrumental guided by stinging guitar licks. I love the guitar sound on this. And when the guitar draws back the synths are still in space. After a while vocals are introduced and they're efx'd in a way that sounds really creepy, and paired with what sounds like might be a female voice, and it all goes great with the music. We get different, and even stranger vocals later on. The synths start to get freaky, which along with the guitar makes for quite a combination. Wow, an outstanding off the beaten path space rock excursion with an avant-prog edge. Did I say I love the guitar on this?! This album is clearly where Oax and Yan seem to have found themselves. A spaced out brand of psychedelic rock, heavy on the grooves, and not afraid to experiment. After communicating with Stefan for a couple years and enjoying their albums, as well as previews of their upcoming music, we decided it was time to tell the full Joxfield ProjeX story. The following interview was conducted by email with Stefan Ek. I did little editing, preferring to leave Stefan's detailed responses intact in the interest of preserving the flow of the story. Aural Innovations (AI): You've got a 40 year history, though 1975-2005 was a period of "long intermission", as you say in your bio. Tell me about the origins of Joxfield Projex, the pre-1975 period. Stefan: It´s 47 years since we first met, the first day in school, but it took two or three years before we became best friends. We both had a great interest in listening to music. Growing up in Sweden in the early 60s was ok. There was some Top-of-the-Pop-alike shows on TV and some pop programs on radio. Sweden was the first country outside England which welcomed The Beatles with open arms, which they really appreciated and which made a lot of Brit-pop bands finding their way here. Janne and me loved the Beatles and inspired by them we started doing some very simple not-too-good songs in 1965 and on. Just having the melodies in our head, writing down some bizarre could-be-English words to it. And sang the tunes to each other. In 1969 we bought two tape recorders and started to record everything we could. Our ability to make songs had at least developed a little. We had started to learn to play guitars and added some whatever-there-was-to-be-found-percussion to it. What´s really comparable from nowadays to those days long ago is our schizophrenic relationship to our music: We mixed various styles as much as we liked and didn´t care what anyone else thought about our music but us. It could be silly 2 minute tra-la-la songs, but also cut-up-collages, sound experiments, whatever. One song was 3 seconds, another 82 minutes. So it was. We constantly recorded about 1-2 hours of music a month. Mostly it was only Janne and me, and we called ourselves Don & Mac until 1970, then it was Andersson & Ek. 1970 - 72 we sometimes had a third guy involved, SG, and when so we called ourselves The Age. No matter if we were two or three guys we started to improvise a lot. Janne bought an organ and I mostly played some percussion, sometimes guitar. SG mostly played the bass when he was with us. Sometimes there was one or two other people present when we recorded. If they could play any instrument we asked them to do, otherwise they could clap their hands or whatever. But mostly it was Janne and me. When we made some music in Swedish (not much) we called ourselves Stefan-Olofs Orkester. Once we tried to involve some guys with classical training (violin, contrabass…) and called ourselves Viscously Cartilage. But they couldn´t manage the improvisations, so it shortly failed. Summer of 1974 we both bought better tape recorders, with sound-on-sound, and we recorded what became our last complete session. Janne went to military service. The following summer we tried to do some music, but it only became a 16 minute unfinished piece with the bright name Cosmic Bananas. I went into military service….the beginning of the long intermission. AI: Can you describe in more detail these lengthy collage, experiments, etc you were doing in the early days? Maybe give me an idea of the progression of your music until "phase 1" ended. Stefan: The progression? Actually I don´t think there ever has been any strategy or consciousness in WHAT we do when we do it. It´s all about spontaneity, "I´d like to do a song of this kind or that kind…. ", "Let´s improvise something", "Let´s do a song with vocals", etc etc. Sometimes we had more or less composed songs we also recorded. But, the last years we´ve been very conscious about HOW to do things, by learning by mistakes from the procedures before we go on to the next step. So even though things of course are very different now compared to what happened almost 40 years ago, I think there´s also a lot in common. Our restlessness, our easily being-bored-by-what-we-do, the huge variety of what we do….. In the early days we lived very close to each other and met almost every day, even though we made recordings only about once a month. Did we have any prepared/composed material when we met, maybe we recorded it, otherwise we improvised. Even though the very first, childish steps were taken in 1965, some better developments happened from 1969 and on when we bought our first tape recorders (Philips mono, one each) and started recording all we did regularly. This also changed our way of making music. In 1969 maybe 95% of what we did was more or less written material, and 5 % improvised. In 1975 it was the opposite way, 5 % written, 95% improvised. Lots of what we did then is today unbearably boring to listen to. Most of what we did was more or less ordinary music (depending on who you ask), with or without vocals, but some of it had some very experimental approaches. One collage made in 1969 I remember, Electronic Opera, which was made by Janne. It was a combination of various recorded pieces, both our own and ripped from records (very, very early sample, you could say), and the tape cut into pieces and glued together again in another order, some of it backward, combined with strange fuzz and bliss sounds, some speaking voices etc etc. The track was about 8 minutes long. Another odd track was a piece called A Strange Symphony Pt 4, which consisted of a two-note chord of two of the black keys close to each other of Janne´s, then Yamaha Organ. There was something wrong with these two keys we realised. You couldn´t take a proper chord. The two notes were gliding, back and forth, almost like a competition, with a kind of yelling/screaming sound which almost did hurt your ear. It wasn´t nice at all. What we did was that we put a candlestick on these two black keys, started the recorder and left the room for some coffee. After 20 minutes we went back to the room and turned the tape recorder off. I think we maybe have heard that two-note terror of sound once or maybe twice, not more. We offered friends money if they could bear to listen to all of it with headphones. Some tried, no-one succeeded. In 1972 and 1973 we wrote some long, epic lyrics with science fiction and/or mental illness themes and then recorded mostly improvised music to it. One of these, Panic Mass, was the 82 minute track. (Another was 75 minutes). In 1974 both of us bought new tape recorders, Sony, stereo with sound-on-sound. This equipment was only used for 1½ sessions. Some of the music made then sounds quite interesting even today. Spacey and psychedelic, maybe the last things we made before the long intermission is a representative link to what we do today. One of the tracks of that session was called For Iggy And The Starship Hawkwind, and was of course a homage to the power of Iggy´s Raw Power and the early 70s Hawkwind spacerock, especially In Search Of Space. The only sung words in that track was a lot of repetitions of the track´s title. Nothing was of course released. The technical quality was crappy and probably most of the musical quality too. A little of it is saved on cassettes and listening to it is partly embarrassing, even though it's joyful, too. But, what´s really interesting when listening to it is how comparable the openmindness to music is from the youngster way back long ago to the old bums of today. All inputs mixed, no matter if its a soft ballad or ambient piece or some brutal shouting noise. We never played live. The one and only occasion when we entered a stage was when we were terribly drunk at a pub and the stage was opened to anyone who wanted to perform something. We went up and made some weird acoustic version of Canned Heat´s Refried Boogie, combined with a Laurel and Hardy sing-along-song, Honolulu Baby. The only ones enjoying it were those more drunk than us, so let´s forget about it…. Ok, There has been a lot of words about this early era of ours. It´s a bit like remembering the youth of ours. Nothing of it has any value for anyone but us I guess. For us it´s interesting because without it a doubt there would have been any Joxfield today. You´ll never know if you keep the word you say, but when we started our Joxfield activities and realised it wasn´t just a one-time occasion, we also immediately decided not to go backward, only forward. For us Joxfield has no relationship with the past, with the unavoidable exception that it is us both guys involved. Joxfield ProjeX is a new band. AI: Was the core of Joxfield Projex always Oax and Yan? Stefan: Yes, always us, but never with those names, that´s a latter days invention. AI: :What were you doing in the 1975-2005 period? Just not working together? Doing any music at all? Stefan: Strange how fast time goes, isn´t it? We grew up, fell in love, went to various education, started our day-time jobs, Janne moved to Stockholm with his then girlfriend, now wife. I stayed in Gothenburg, got married, raised three kids, Janne raised two in Stockholm…. I just think life came in between. There was no dramatic split up or anything. Things just came apart. No hard feelings or so, just personal stuff. Christmas cards and some vacation cards, nothing else, for almost 20 years. I think that one reason that things work so fine nowadays when we make music is that even though we are very different people we also do have so much in common. Janne is the digital kind of person, I´m the analogue. I have always listened very, very much to music. 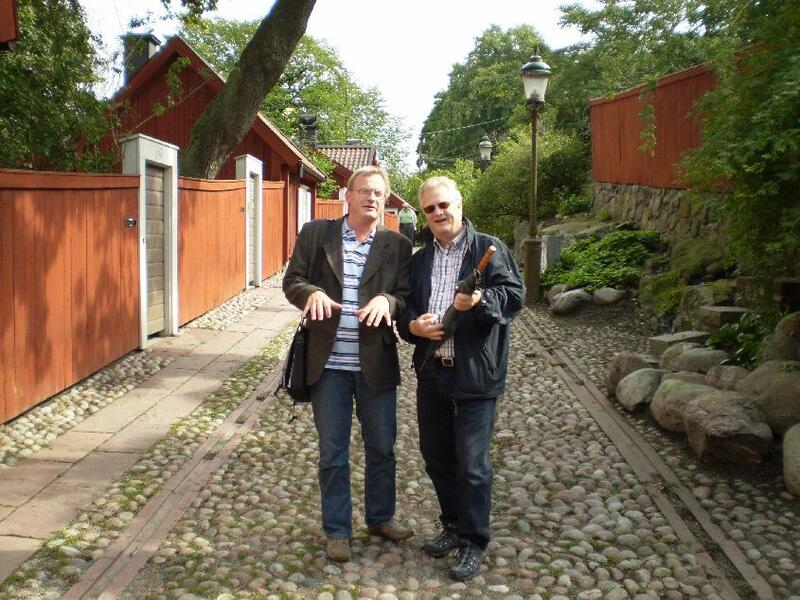 Janne stopped for years (and I had to be his 'teacher' in new music…). So, as he describes it, Janne sometimes sat down with a keyboard and tried to find some interesting sounds to use sometime in the future. "I´m looking for the perfect sound" he said. I myself started to do loads of sound-on-sound recording for about ten years, then inspiration went away and nothing was left. I spent some time sitting in the sofa with some jam-record on and played guitar to it. Maybe I'll learn something, I thought. AI: What changed to make things start happening again in 2005? Stefan: This is the really interesting part. The reason for me (which means both me and Janne, but as I´m the correspondent person of the band it´s me…) to wonder if it wasn´t time for The Big Interview. During the 90s I had to go to Stockholm a couple of times a year and I contacted Janne and we met. Very slowly our friendship re-established. Every time we met it was like all those years hadn´t past. Maybe the only thing we had in common was our childhood/youth together and our interest in music. So, we drank wine or beer or whatever and talked about those subjects, laughed a lot, listened to loads of new music I brought with me, interesting stuff from The Big World. In 2003, when rather drunk, we started talking about, "Wonder what it would be like trying to do some music nowadays?". Technically it would be possible with Janne´s computer. The next day it was mostly forgotten, just silly drunk talk. But this continued a couple of more times, so in Autumn 2004 when we once again talked about it we decided to go away for a week somewhere in the spring 2005 and NOT forget about it the next day when we were sober again. The first week of May 2005 we went away to a cottage I rent for the summers. Janne´s computer, Cubase, his keyboard, my guitar, some efx pedels I´d borrowed from one of my sons. No music preparation but a paperbag with old stuff. Just to try to find out if it´s fun to record. We tried the equipment with a very old song. After an hour or so we were completely bored and said: "Let´s skip it, we need to play, let´s improvise some…" And we did. Two simple chords, some keyboard noise and five minutes later we had what became our first song, Hurricane. Then it started to flow. Instant composing, improvising, and a week later we had what became our first 2-CDR, A New Morning. Very few overdubs, almost no editing, very primitive, but it showed us there was some music within. We decided immediately to go on, meet again half a year later, but prepared with composed songs. Autumn 2005 we went to Kolpebo and a small house we borrowed from some friend to Janne´s wife. We had 40 - 50 more or less finished new songs with us and recorded 13 of them to what became our second CDr, Nothing But Sofa, our structured pop song record. Each night before bedtime we made a ten minute pure improvisation, which became the companion CDr, Live At Kolpebo. Spring 2006. Kolpebo again. We both thought the pop CDr wasn´t as good as we wanted it. Maybe it wasan´t our style to do pop music. We had some structured songs, some patterns and we improvised a lot. Some editing and treatment afterward, but not too much. This session became the 3-CDr The Pond Intermezzo. Then we discovered MySpace, uploaded some of our music and had some nice response to it which really inspired us. AI: This past weekend I listened to the entire Pond Intermezzo, plus all the other music you've made available to me, and I am very impressed with the variety of progressive, prog-psych, electronic and experimental music. Even the experimental stuff is... in its own way... very accessible. Stefan: There are a few outspoken, but unwritten rules between Janne and me: Whatever we do must be interesting for us both to listen to (As Janne says: 'If we don´t want to hear it, who else would? And if we like it we do have at least two listeners' - Wise words). Whatever we do must be done with agreement from us both. (We´re a very, very democratic little combo, neither of us rules more than the other over the decisions. We criticize each other´s - and our own - contributions a lot, but in a creative way. All we do is for the band, not for our egos.) When having contributors of various fame. It´s important to have them involved for the sake of the music, not the sake of their fame (even though it´s of course not forbidden to mention their origin when commenting them or adding one of those tracks to the Myspace player, etc). Accessibility? Haven´t thought about it. I think a lot of what we do has to do with the first of the unwritten rules. As an example, we´ve realized we often like our music better when it has some kind of beat somewhere instead of just free floating rhythm. Some of our latest tracks are originally unrhythmic, pure improvisations, but when working with the track, editing, adding stuff, it ends up with some rhythms, if not all over at least here and there, and we think it makes the music better, brings some positive tension to it. Also, regarding rhythms, programming and sampling of beats, percussions etc: Our first four recordings have very, very simple rhythmic patterns. Now, on our forthcoming stuff, we´ve been working very much with that part, have made it complex in a much more interesting way. When improvising it´s a very big difference between enjoying what you play when you play it and later enjoy listening to it when it´s recorded. It doesn´t always work fine. So, we continue working with it. It´s also nice if the music we make can challenge the listeners a bit. You don´t have to listen to it carefully at every moment, but the music isn´t made for falling asleep (but if you do it´s ok too. It´s up to the listener to decide what to do when listening). I think that maybe the most challenging aspect of our music is the variety of it, which I guess is a bit of a commercial suicide. Who is the music directed to? I´ve been thinking about it and have more than once come back to what I probably should choose as The Best Record Ever Made: Beatles White Album. Why? I think it´s a brave album, with the variety, the completely maniac mix of Obladiblada & Revolution # 9, Honey Pie & Helter Skelter, Long Long Long & Good Night etc etc. Loads of good songs, but who else would put them on the same record? Ok, they already had their fame and money, they were an unhappy band at that time, they knew anything from them would sell a lot, so, from that point of view maybe it wasn´t so brave. But artistically it is, in my opinion. So, with no other comparison with the Beatles, why couldn´t we have the same aim, to make anything that just follows our (splitted) hearts and try to release it. It´s important for the creativity and the quality of what you do to be true to the heart, not try to think What Do They Want, no matter if it´s commercial hits or uncommercial, whatever. But, beats are ok.
AI: Nothing But Sofas was your "pop" songs album. But there are clearly progressive elements too. Tell me more about that album. Stefan: After DarkWhiteMorning we wanted to go on and try to do some constructed/composed songs, mostly with vocals. Neither of us can sing, but we tried. During the half year between the first and second session each one of us wrote as much as possible. We also gave each other words or music missions. When time for recording we had 40 - 50 tracks, some almost completely finished, some just a beginning of an idea. Out came 13 songs, 10 with vocals. Some of it was recorded in small pieces and put together. Each night ended up with a ten minute 100% improvisation. The only preparation was a couple of minutes to find an easy beat in a suitable tempo. No mix, no overdub, nothing but the recording. When it was time to structure some CDr release we thought the constructed and the improvised pieces wouldn´t fit together too well so we made it two - Nothing But Sofas and Live at Kolpebo Festival October 2005. Reflection: After a not too long while we found Nothing But Sofas uninteresting, we stopped listening to it. The Live one was funnier listening to, no matter all wrong notes and all that (the first track is really crappy, actually, but the other´s partly ok). Maybe we shouldn´t do ordinary songs with vocals? Maybe we should have waited a couple of years ('till now?). Let´s see what the future brings. Pond was an attempt to bring the experience of the first year together. Much of it was based on prepared patterns over which we improvised. There was even some composed songs, these ones with the vocals. I didn´t have any recording program in my computer, but Janne wanted to edit it and it was ok. I constantly was receiving files from what he was doing and had opinions about what to do, if I thought so, or not, if that was my opinion. Some intense conversations over mail. We included most of what was recorded into the 3-CDr, but arranged it thematically. We still think The Pond Intermezzo is ok.
As The Pond Intermezzo was finished by Autumn 2006, we also discovered Myspace and the possibilities of uploading some of our music for people to listen to. As our music is so varied we decided to open up four sites, or spaces/spheres. The Orange Mothersite for our most recent stuff, The Green site for our ambient stuff, The Blue site for our vocal tracks and The Grey site for our old stuff (which wasn´t more than a year old). Later The Grey site was changed to the Side ProjeX site, for the moment the Lumbago track. We think Myspace is good, even though it´s a hell of a lot of scratching each others backs, but in some way that´s nice, too. We try too keep the site honest to our music and the music we like and can agree with. We don´t say no to friendship with kind and serious people even though we maybe don´t like their music too much, but we say no to unserious sexistic sites, odd political sites etc etc. We want our Myspace to be based on music. Without Myspace we probably never whould have found Aural Innovations? AI: And of course you are working on the new album. Was it a conscious decision to start including so many other musicians? Or was this the natural result of easy networking via the internet? Combined with these thoughts about our future music there were some very important things that happened in Spring 2007. The first thing was that I bought a new combi-efx-pedal to my guitar, which also included one of the Cubase recording programs. I could start doing music from my own home, add stuff to our music. This was the beginning of what should be some highly intensive files-sendings to and fro between Janne and me a couple of months later on, and has continued since then. We constantly add stuff to each others addings on and on and on, the quick realizations of ideas and not only talking and Janne has to do all the hard posterior work with the music. AI: You have some very interesting guest contributors on the new album. How did you hook up with such luminaries as Pat Mastelotto? Stefan: The third important thing that happened Spring 2007 was that we thought it could be good with some new input to our music, as a way of developing it. Add others instruments, some other voices, etc. Of course Myspace and the internet was important here. Some of our Friends had already asked if we wanted to collaborate with them and we also put out some requests to people we thought would be suitable for the Joxfield music and bring it to better levels. As I´m the sort-of correspondent person of the little combo and the one who always has listened an awful lot to music, and knows a lot about artists and their music, I was the one to try to find people to collaborate with. Janne trusts me completely with this, who I choose for what, and so on. Dealing with the Myspace site I was also surprised by how many of these artists of various fame who were close to the site, even managed it by themselves. It made it easy to ask the collaboration questions. No matter who the person we ask is, the crappy deal is the same: We have nothing to offer, as we have no money. If there will be a release and if there will be some income of some kind, we share equally. Even if we had money to pay we wouldn´t have wanted to hire musicians, we wanted their musical souls. Over Myspace they have heard (and liked) the The Pond Intermezzo stuff and we asked them if we could send some of the new music for them to listen to. Some communication with future contributors was made before the actual recording week in June 2007, but most of it was made early Autumn and on. Regarding people like Pat, I think we were coincidentally lucky. The contact with Pat was strictly about one track, TheEntropyIsStrong, which basically was a wonderful soft keyboard improvisation in 70 bpm by Janne, with some simple programmed drums, to which he wanted me to add things. I thought it would be great with some 'live' drumming and with this in mind I contacted Pat. He answered immediately that he had one day off and had his equipment up and running in his garage/studio for some action and asked, 'What do you want?'. I answered 'Something in 70 bpm' and added 'plus something in 120 bpm', because that´s a tempo we like and use to do a lot of stuff in, so it could be really useful. In a day or two he sent those two files for listening and I was astonished. But the 70 bpm drumming didn´t fit to the specific track at all when it was added (and Pat wasn´t the one to blame, as he hadn´t even heard the Entropy track). So I took a chance and sent Janne's original Entropy file to Pat and after yet another day he sent his great recorded drumming back. Perfect. Later the 70 bpm drum files were used to create (and re-create etc etc) the LandscapeAhead song, and the 120 bpm drum file was used to create (and re-create, etc etc) the Ruff&Tough track. That´s how we have three songs with Pat on drums. Nikke Ström has been a rock/blues institution in Sweden on bass for the last 30 years, but I think not too close to the kind of music Joxfield makes. He´s also managing his own Myspace site (which I by that time hadn´t discovered) plus Nationalteatern´s (another musical institution in Sweden). When I discovered they had a Myspace site I felt I just had to put in a Friendship request and later in my comment when thanking for the addition and nice comment from Nikke I wrote that I didn´t think he would like the Joxfield music too much as it mostly is noise. 'Noise!' he wrote… 'It´s hell of a good music! Need a bass player, just let me know….' Of course we said yes to him. As he has no recording facilities. We had to bring our computers to his rehearsal room over a weekend. He laid down basses to most of the tracks we wanted to, but unfortunately it later seemed like the sound quality wasn´t too good. Something had happened with the files which we hadn´t noticed so some of the basses were unusable, but some we were able to use. Especially his dub-a-like bass in the Entropy track is really heavy and great. Spoken word poet Kenji Siratori heard our music and wanted to collaborate. We like the mantra-like sound of his voice while reading his dystropic (and un-understandable lyrics, even when they are translated), almost like an instrument. He sent some poems and so far we´ve been using two of them for this project, Kenji Self-Unit (a working title we´ve kept), where nothing is done with his voice. The music is inspired by how he sounds. The other one is ForARainyDay 1, where I have treated his voice in an almost manic way. We cut it into hundreds of pieces, changed everything that can be changed, pitched it, echoed it, backwarded it, copied it, whatever, and then constructed the background from various samples of our own files, also heavy treatments. The basic background is a pure improvisation when Janne and I tried to make electronic music. I think somewhere this is the trace back to the experiments we were doing almost 40 years ago, even though this is much, much more complex. After about 6 minutes the electronic improvisation turned into the riff that´s heard, that has become FARD 2. Regina P of Copernic # added vocals to the only two vocals tracks, Over&Out and NoKroPoh. The latter is a hymn to some friends we´ve had that died too early in their lives because of various diseases. It´s meant to be very soft, but after working with it a while it felt more like a march than a sensitive hymn. After a while of thinking the song was radically changed. All but vocals and sitar were thrown out. Instead I added the environmental sounds and Janne added the ambient drone sounds (made of the original guitars - don´t ask me how - Janne is really talanted!!!). Now I think the song is really great and a really suitable last track of the whole collection, following the peak of Entropy. José of OPPP has become a very close friend to us through Myspace, with lots of communication over the years. As he appreciates our music so much we thought it could be nice having him with us with some samples (he mostly works with samples he makes himself). He loved it and sent some samples we could use in whatever way we wanted. Most of them weren't usable for the music, but some were. Some sounds of the Kenji part of FARD is Josés and the elephant guitar in Silent Night is some heavy treatments we´ve made from his files, as well as in Night Silent, the ambient part. AI: Tell me about how you are collaborating with all these people. It sounds like they are scattered around the world. Is everyone uploading digital files of their contributions to servers or something like that? Stefan: Well, I guess you´ve already got the answer. It´s all about sending files to and fro. We´ve also discovered the possibility of free servers (like skickafilen.nu) which is a really useful tool. We have no studio or access to anyone, so this is how it has to be done. The Nikke files were an exception and only possible as he and I live in the same town. AI: Are you currently label shopping? Back to subject: Janne is the digital one, he thinks that the internet is the one and only future way to get the music out. I guess he´s right. But as I´m the analogue kind of person, I´d like to have the physical experience of a release, a cover to hold while listening, some art, some insert with info. I would even love to have our music released in LP versions. It´s just beautiful. But maybe the most important reason for trying to find a serious label is we need anyone who could do the advertising, the sending-away-promos-to-papers-and-radio-stations, anyone who could distribute it all, with good routines and experience of all that. Plus, we can´t afford a physical release. We haven´t yet sent out any of the tracks. I think even though you sent a three or four track demo it´s good if the whole material is (almost) completely finished, otherwise it´s not representative of what you do. Any suggestion where we should go with our music is most welcome.